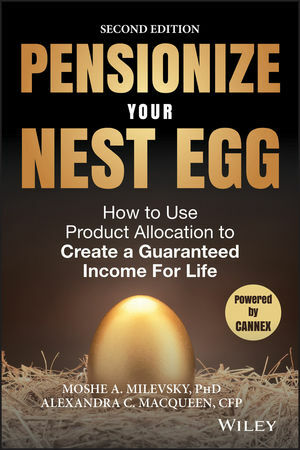 Pensionize Your Nest Egg describes how adding the new approach of "product allocation" to the tried-and-true asset allocation approach can help protect you from the risk of outliving your savings, while maximizing your income in retirement. This book demonstrates that it isn't the investor with the most money who necessarily has the best retirement income plan. Instead, it's the investor who owns the right type of investment and insurance products, and uses product allocation to allocate the right amounts, at the right time, to each product category. This revised second edition is expanded to include investors throughout the English-speaking world and updated to reflect current economic realities. Readers will learn how to distinguish between the various types of retirement income products available today, including life annuities and variable annuities with living income benefits, and how to evaluate the features that are most important to meet their personal retirement goals. Whether you do it yourself or work with a financial advisor, Pensionize Your Nest Egg gives you a step-by-step plan to create a guaranteed retirement income for life. MOSHE A. MILEVSKY is Associate Professor of Finance at the Schulich School of Business and a member of the Graduate Faculty in the Department of Mathematics and Statistics at York University in Toronto. ALEXANDRA C. MACQUEEN is a Certified Financial Planner professional in Toronto.